Quick take: At the end of February the inflation-adjusted S&P 500 index price was 107% above its long-term trend, up from 96% the previous month. The peak in 2000 marked an unprecedented 137% overshooting of the trend — substantially above the overshoot in 1929. The index had been above trend for two decades, with one exception: it dipped about 15% below trend briefly in March of 2009. At the beginning of March 2019, it is 107% above trend, exceeding the 68% to 90% range it hovered in for 37 months. In sharp contrast, the major troughs of the past saw declines in excess of 50% below the trend. If the current S&P 500 were sitting squarely on the regression, it would be at the 1331 level. Incidentally, the standard deviation for prices above and below trend is 41.30%. Here is a close-up of the regression values with the regression itself shown as the zero line. We've highlighted the standard deviations. 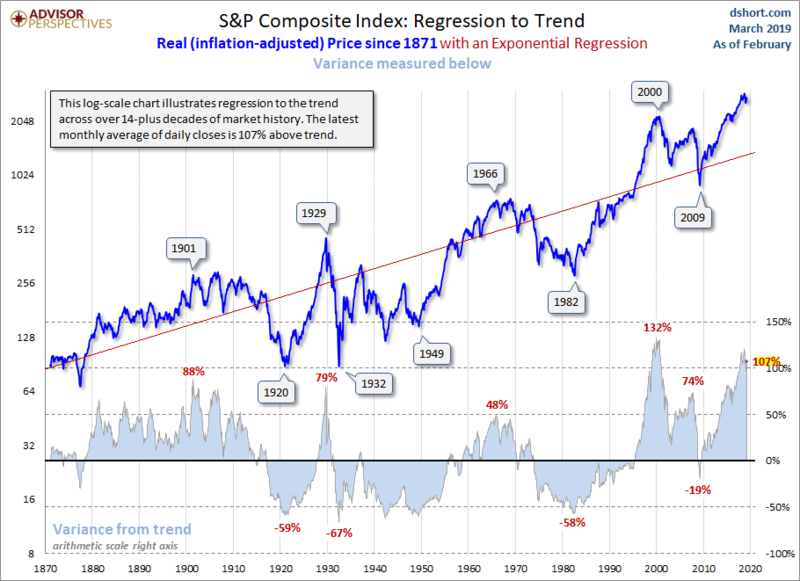 We can see that the early 20th-century real price peaks occurred at around the second deviation. Troughs prior to 2009 have been more than a standard deviation below trend. The peak in 2000 was well north of 3 deviations, and the 2007 peak was around two deviations, below the level of the latest data point.